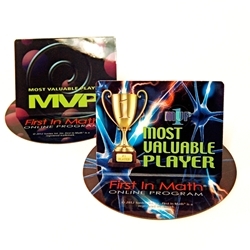 All of your students will be trying to earn these beautiful, full-color First In Math® MINI DESKTOP AWARDS! Small sizes fits on any desk. Different design on each side - choose/change which one you display! Durable 30mil plastic composite ships flat. Pack of 10 for $10. Made in USA.